If you work with multi-cylinder, multi-carburetor engines for very long, you will want a manometer sooner or later. A manometer is a device for measuring the difference in pressure between two systems. There are a multitude of commercially-available manometers, the most popular of which are the mercury "carb sticks." Running somewhere behind them are the TwinMax electronic system and a host of others. Each of the commercially available systems has its positive and negative sides, plus they all cost a considerable amount of money. Examine the diagram on the right. It shows a completed manometer. Construction is as simple as it appears. Cut your 1x3 board off at about 5 or 5 1/2 feet long; the exact length is unimportant. Drill 1/8" holes in two sets at lengths along the board. Each set will have a zip tie passed through it, so space them about 1/4" apart to fit the tubing. Space the sets evenly across the width of the board. The total length between the bottom of the loop and the top set of ties should be at least 4 feet. You may want to have more or less zip ties than are illustrated in the diagram. When I made my "nice" water manometer recently, I ended up using 11 zip ties total: 5 down each side, and one at the bottom of the tubing loop. Once your holes are drilled, poke a zip tie through one of each hole set, so that the head of the tie is on the back of the board. Find the middle of the tubing, and lay it down at the base of the loop. Then, working up the board, loop each zip tie over the tubing in turn, until it's all fastened in place. Use the scissors to trim off the excess tie material. Don't tighten the zip ties too tight, or you'll collapse the tubing and it won't work right. You should have 5 or so feet of loose tubing hanging off each side of the manometer when you're done. These tubes will lead to the vacuum ports of each cylinder when you're using it. Finally, drill a 1/4" hole at the top, so it can be hung from the ceiling, or a nail on the wall, or whatever. A coat hanger makes excellent hook material if you want to make a hook for the top. Filling up this kind of manometer is actually much more difficult than you might imagine. There are any number of ways to go about it, and I'll describe a few of them here. The goal is to get about 2 feet of water in each "side" of the manometer when you're done. Before attaching your tubing to the board, fill up a bucket or sink with water, at least several inches deep. Submerge your tubing in the water a bit at a time, filling the tube as you go. Once it's all full, grab each end, and pick up the tube. Blowing with your mouth, or just lowering one end of the tubing, empty it out until there's only about a four foot length of tubing with water in it. Carry the tubing by the ends back to the board and attach it. Immerse one end of the tube in water, and attach the other end to a hand operated vacuum pump. Use the pump to fill the tube part way, and even it out until you have about four feet of water in the tube. Using a large syringe (like a marinade injector from a kitchen store), slowly push water into the tube until it's about four feet full. Once the manometer is full of about four feet of water, and is attached to the board, the easiest method I've found for getting the water to even out is to let it sit. Eventually, gravity will do its job, and the water will all fall to the bottom of the tube. If you're feeling impatient (like I usually am), you can bounce the bottom of the board off the ground, forcing the water down. DO NOT use compressed air or any kind of powered vacuum pump to try and even the water out, you'll most likely just blow out all the water and have to start over again. There's no requirement that you actually use any of the materials in my list, above. For instance, I had a water manometer for years that was mounted to a piece of 1" PVC pipe and had 3 zip ties holding it down. No holes to drill, and even cheaper than wood and 11 zip ties. I found it to be ugly, though, and eventually reworked it to be mounted on a proper board -- it's also easier to read that way. You can use just about anything that's around 5 feet long and can have tubing fastened to it. If you've got a bundle of wire lying around, tie on the tubes with wire. If you have a bucket full of epoxy, use that instead of ties. The possibilities are endless. You could even leave the tubing capped, and unmounted, so that you could carry it on the bike with you for mid-desert carb balancing. You can also improvise the pointer material, if you didn't want to use water. I've seen people use a design like this (but smaller) with motor oil or automatic transmission fluid. Oil or ATF provides more damping, making it easier to see the overall trend of pressure, rather than the instantaneous changes. Water, being so light and low viscosity, will react instantly to any changes in pressure -- this can be good or bad. I recommend you try this design with water before substituting materials inside the tube. Water is a very safe material to work with, even around running engines. It won't cause brain damage like mercury will. Should it be sucked into your engine, it will be vaporized, steam cleaning the combustion chamber as it goes. (I've done this on a poorly balanced BMW with no ill effects.) I don't recommend repeatedly sucking water through the same cylinder in one session, since you could over-cool the cylinder. 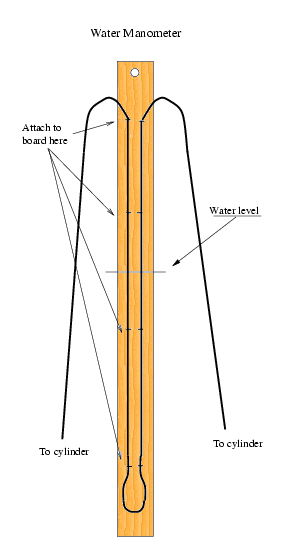 The idea behind a manometer is that you hook it up between two systems (such as two cylinders in an engine), and the pointer material in the middle -- water in this case -- is sucked toward the side with lower pressure. This water manometer works exactly the same as mercury carb sticks, except that the water isn't as dense as mercury, so you need more room for it to move around. When you see that one side is higher than the other, you know that the cylinder attached to that side is pulling more vacuum than the other cylinder. Created by Ian Johnston. Questions? Please mail me at reaper at obairlann dot net.